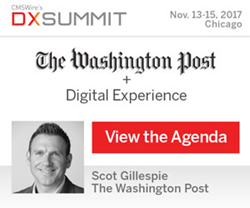 DX Summit 2017 (#DXS17), an annual digital customer experience conference produced by Simpler Media Group for the publication CMSWire’s community (Nov 13-15), features four new keynote speakers from diverse industries and background in digital innovation and customer-centricity. Howard Pyle of MetLife kicks off Tuesday morning with a digital transformation story modelling better CX teamwork. Annette Franz of CX Journey brings Voice of the Customer (VoC) into the future by modelling top performing competitive customer strategy. Shawn Goodin of JPMorgan Chase & Co leads Wednesday morning’s discussion of artificial intelligence by grounding this emerging technology in information architecture. And Scot Gillespie of the Washington Post finishes the conference on a high note with an examination of super customer experience and growth through strategic development in technology, business and news. DX Summit 2017 also features a range of deep-dive workshops from Google data platforms to customer journey modelling, as well as sessions devoted to innovative customer-centric strategies and digital experience technology project development. Analytics and customer data play a large part in developing the content of this highly interactive, engaging conference for marketers, practictioners, technologists and analysts looking for new insights into the customer experience online. DX Summit brings together the world’s foremost leaderswho are defining the next generation of digital experiences. DX Summit 2017 will be held November 13 to 15 at the Radisson Blu Aqua hotel located in downtown Chicago, IL. Registration is currently open on the DX Summit site. Inquires may be directed to Kathryn Woodworth, Marketing and Events Coordinator, at kathryn(at)simplermedia(dot)com or 1-800-939-1913 x722.